Simulation of construction projects based on tender programme or baseline schedule with exciting output. With the detailed drawings of your project and schedule of activities, we provide you simulated video to show scheduled weekly progress from selected angle as shown on the sample picture. Milestone Simulator is a software to visualise multi-storeyed building projects during the planning stage, simply from its elevation picture. The unique feature of Milestone Simulator is it does not require detailed schedule of activities. Instead; it uses only milestone dates. Introuter allows you to visualize actual progress and planned progress views of multi-storeyed building projects simply from its elevation picture and updated schedule of activities. Consim generates 3D project progress visualization for project stake holders like contractors and property owners. Using state of the art technology, Consim produces 3D simulations of planned and actual project progress for any day thereby giving user instant comprehension of the pace of the project. 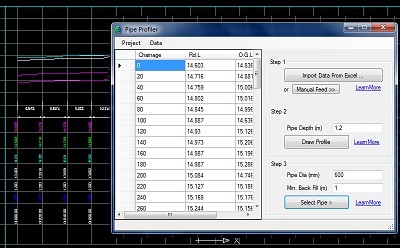 This software is designed to draw pipeline profile of water lines based on DEWA standards. GPA is an advanced progress drawing technology to review your project in planning stage and to monitor while progressing. GPA does not require AutoCAD to view the output, it has its own viewing application with many useful features to filter activities.